Vote in the polls below, and explain your votes in the Comments section. Grade Union sporting director Earnie Stewart's performance this year. Grade Union chairman Jay Sugarman's performance this year. 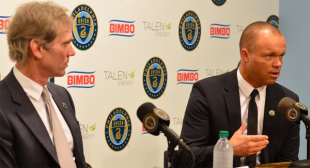 Grade Union head coach Jim Curtin's performance this year. Grade Bethlehem Steel head coach Brendan Burke's performance this year. That single “A” vote for Jay Sugarman’s performance is most definitely not Jay Sugarman voting for himself. Anonymous Union intern strikes again. I gave Sugarman a “b”. I don’t see all of this as his fault. The guy is not rash, and he has to trust the soccer people he hires. I don’t grade Earnie poorly, either. The reality of the rest of the league improving may have distorted the success of the plan. I have no doubts that there us one. Personally, I think the problem is that this is much longer term than they want to admit. They’re not communicating properly, if so. Curtin, otoh, is out of his depth. If what I think is correct about the long term nature of the plan, then we most definitely need to hire a tata level manager to get the most blood out of this current financial stone. Stewart definitely deserves a higher grade than Curtin. ES did such a good job of replacing Nogueira people completely forgot he also had to replace Nogueira this past offseason. Barnetta i’m assuming you meant for this past offseason. Stewart is the one who left the team without backup striker options. We had one guy to spell Sapong, which is not sufficient, and he was a total bust. Most damning, everybody and their sister knew that the Union needed a #10 by, like, April. Stewart did nothing to get us one. Then we he spoke publicly about the squad, it did little or nothing to inspire my confidence that we would ever be anything but a mediocre team without ambition. For all this, he gets a D in my book. I blame Curtin less than I blame Stewart. Curtin didn’t exactly get the most out of this squad, but the pieces simply weren’t there. Es has always had 2 backups. THe 3rd was invisible, but Charlie Davies was there. He GAVE Curtin one guy to spell Sapong, and he was never used. That’s on Curtin. #10 is a known issue and of course ES’s biggest failure. But I don’t think keeping Ilson and Alberg on the squad was worse than Curtin flailing around and trying to jam a round peg into a square hole. Earnie also laid the ultimatum that we don’t change “our system”, we stick with an ill-fitting 4-2-3-1 because our players are incapable of learning another formation. We had already replaced Nogs with Bedoya last year. I don’t get how people excuse Stewart and blame Curtin. Stewart is his boss. Does anyone think that if Stewart went to Curtin and told him to play more young players or change formation, that Jim would tell him no? If you don’t believe that, then why aren’t you mad at the decision-maker’s boss for not directing him? what worse than an ‘F’?? Not giving an ‘F’, which is where most fans are going with these days. all my votes mirrored the majority…; that was fun! Seriously though, I am surprised that Curtin is getting off so lightly in this poll. I gave Curtin an F because he did worse than last year’s crappy performance. It really seems like he has hit his ceiling as an MLS coach. Stewart got a D because there is some hope he will get better, but he didn’t make any moves during the season, even though the needs were obvious. I don’t know if Sugarman refused to spend more or if Earnie didn’t find anything he wanted to buy. Let’s see… Curtin got the same amount of points as last year, +6 GD with a worse roster that is bottom 3 in the league and no #10 to speak of. How exactly did he do worse? The team didn’t make the playoffs, that is regression. Who cares about goal differential when the team isn’t in the top 6? The roster was not worse, it was different, and Curtin failed to do anything with it. I gave him an f, but I will say that the huge shift in conference power had an impact on our results, too. Still, he failed to make the playoffs or some semblance of tean unity and vision other than a ridiculous adherence to the 4231.